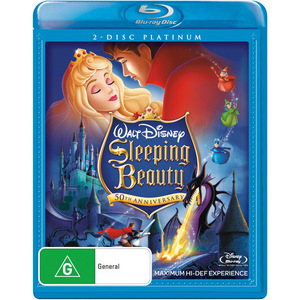 Come celebrate with Disney as Sleeping Beauty celebrates its 50th anniversary in this stunning remastered collection. Before proceeding with the review, I need to point out that both the film and video have been digitally remastered that almost makes this animated movie seem like it was released yesterday as opposed to 1959. The story of Sleeping Beauty revolves around a classic fairy tale with that of Princess Aurora who has been cursed by the evil sorceress Maleficent. For Aurora is a threat to Maleficent and in order to get her out of the way, she casts a spell that on the princess' 16th birthday, she will prick her finger on a poisoned spinning wheel that will cause her to sleep for eternity. Not even the three good fairies who raised Aurora in secret could prevent yhis heinous crime, however fortunately for Aurora, a handsome prince named Prince Philip may be the key to awakening her from this ageless sleep. It's classic Disney at its best that has received a much needed face lift in terms of video and audio quality as opposed to the films of today. Presented in widescreen with exceptional images and a vibrant colour palette, Sleeping Beauty 50th Anniversary Platinum Edition also boasts remastered sound which simply sounds phenomenal, thanks to its Dolby Digital 5.1 soundtrack. Once you have finished with the main movie, you can delve into the secrets of Sleeping Beauty and experience never before seen footage and behind the scenes documentaries that will truly make this movie come to live. This DVD or Blu-Ray is a treat that everyone can watch!